After joining issues with President Goodluck Jonathan over his style of governance, former President Olusegun Obasanjo Saturday stunned guests when he suddenly appeared at the church wedding of President Goodluck Jonathan’s foster daughter, Inebharapu. The wedding was held at the National Christian Centre, Abuja. 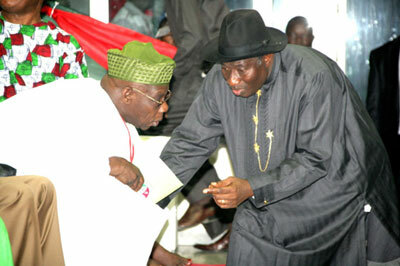 Obasanjo had in his book titled My Watch, come hard on Jonathan's style of leadership. The duo had not met since the public presentation of the book. The former president had recently flayed the incumbent for allegedly mis-using the foreign reserve. Obasanjo's comment elicited reactions from Jonathan's loyalists who rose in support of their principal. However, Obasanjo stormed venue of the wedding with Dr. Andy Uba, as well as a retinue of his before the service. The former president's arrival was greeted with deafening ovation from guests. 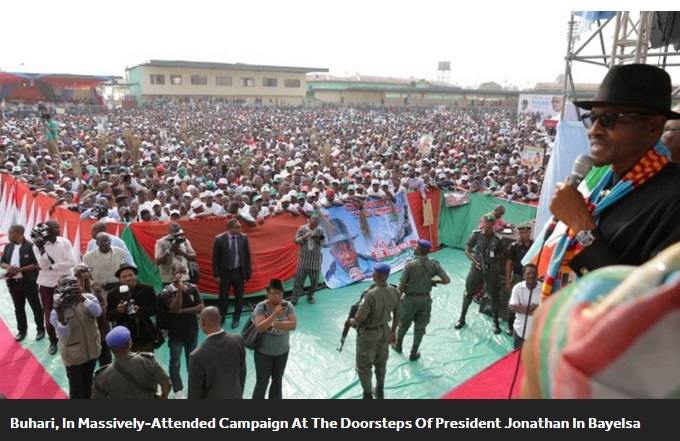 General Muhammed Buhari, presidential candidate of All Progressives Congress (APC) on Thursday took his campaign to the doorsteps of President Goodluck Jonathan in Yenagoa where he pledged to revamp the agricultural and power sectors if elected next month. Addressing a massive crowd, the APC flag-bearer noted that Bayelsa was blessed with a suitable climate and fertile land for large scale agriculture which will be harnessed to drive economic development. He regretted the inability of the Jonathan administration to develop even Bayelsa, his own home state, and promised to reverse the trend. Donning sturdy boots and warm clothing, Joshua Nowicki trekked along the icy shore of Lake Michigan on Thursday morning, armed with a camera. 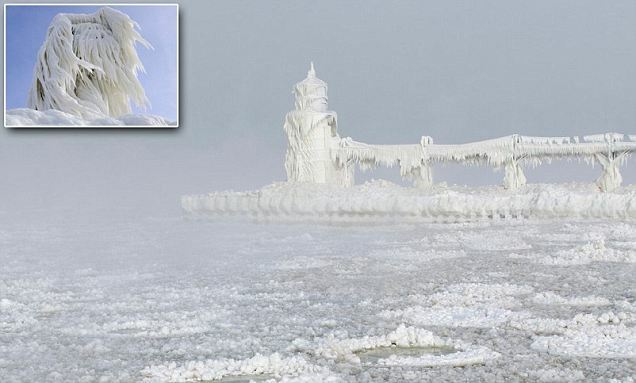 He then captured a breathtaking array of photos of the frozen lighthouse and its pier, both of which were completely blanketed in white icicles (left and bottom right). He later uploaded the images to his Facebook page, alongside pictures of circular formations of ice - what he dubbed 'ice pancakes' - on the shore. It comes as a deadly arctic blast is continuing to wreak havoc across the US, with lake-effect snow expected to dump up to five feet of snow on parts of New York state (inset, Buffalo) this weekend. Top right, St Joseph Lighthouse is pictured by Mr Nowicki on Tuesday, as the cold was starting to take hold. The campaign buses belonging to President Goodluck Jonathan, the PDP candidate in the February 14, 2015 election have been attacked in attacked by rampaging angry youth, some of them set ablaze in Jos. Some angry youth on Saturday attacked and set ablaze a campaign bus branded with President Goodluck Jonathan’s campaign posters at Zololo junction, Bauchi road in Jos, Jos North Local Government area of Plateau state. A pair of classic leather shoes is an ideal, time-tested Christmas gift for a British gent. 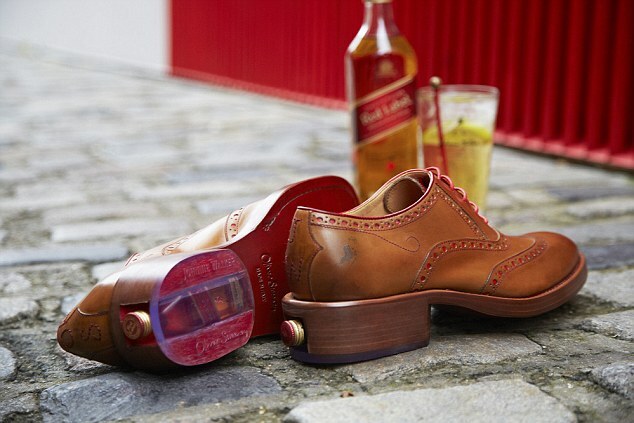 But look closely at the stack heels of cobbler Oliver Sweeney's new designs as each one conceals a tiny bottle of Johnnie Walker Red Label Scotch. The smart Oxford-style shoes are the world's first brogues to hide miniature bottles of whisky and at £295, are the latest designer gift for the man who has everything. We learn how to clean from our parents. They learned how to clean from their parents. And so on. Cleaning is one of those things where we do it the way it's always been done. If your dad mopped a certain way, you're bound to do it that way too, but what if I told you that cleaning knowledge that's been handed down from generation to generation might be wrong? Well, not wrong per se, but there is a better, more efficient way that will make your home cleaner and take less time. Pastor E. A Adeboye Gives His Support To Buhari Tactfully? Read His Facebook Update Hours Ago! The greatest darkness in any nation is always at the top.What a pen robber can steal in one hour,armed robbers can steal in a year. Pray for your leaders. Another one: If you don't bow to Jesus while you are on the top or on the Throne,you will bow to him when you are in trouble or in prison. DR Dre should watch his back as if all goes well, Jay Z may be on his way to claiming Forbes top spot..
A loss by Nigerian President Goodluck Jonathan in general elections next month may be viewed “positively” by foreign investors and probably won’t rattle markets, according to Jim O’Neill, former chairman of Goldman Sachs Asset Management. While Jonathan, 57, has presided over the sale of the nation’s mismanaged power utilities to private investors, his economic policies in the last four years “could have been better,” O’Neill said in a Jan. 7 interview in the capital, Abuja. Firing central bank Governor Lamido Sanusi last year, who brought “a lot of credibility” to the government, sent out a negative signal, he said. Soldiers protecting the town, which has a population of 10,000 fled on Saturday after militants attacked the town's military base. Nigeria's government today said troops had begun a fightback against Boko Haram. 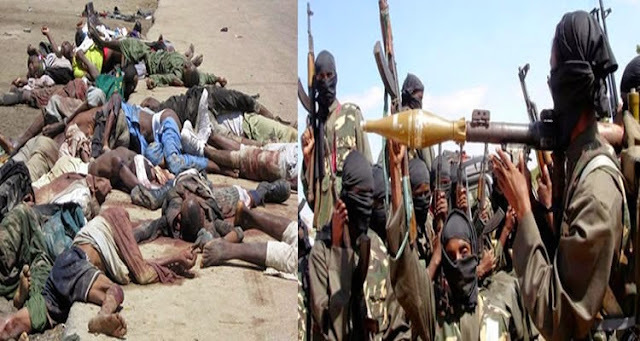 The militants first attacked Baga, in the north of remote Borno state, on Saturday and on Wednesday set fire to the town and razed at least 16 towns and villages nearby. Mike Omeri, who speaks on national security, said security forces had been 'actively pursuing the militants' since the first attack and after the second. 'Security forces have responded rapidly and have deployed significant military assets and conducted airstrikes against militant targets,' Omeri told reporters in Abuja. Boko Haram has been waging a five-year insurgency to carve out an Islamic state in northeastern Nigeria. 10 brilliant Innovations. It Happens only in India! Get ready to see the most awesome chicken ever. This rare breed is completely black, from head to toe. There are a lot of rumors and misconceptions about this chicken. But once you learn about it, you’ll definitely want to share this with your friends. Black is not an uncommon colour in the animal world; bears are black, gorillas are black, there are breeds of dogs and cats that are black. But this Indonesian chicken breed known as Ayam Cemani takes black into an entirely different realm. The black colour of Ayam Cemani is not limited to its feathers – the colour is all over and even on the inside. Everything about this chicken is black – skin, beak, plume, tongue, legs, toe nails, its meat, bones, and organs. Even the bone marrow is black. Would you eat it? The breed originated from the island of Java, Indonesia. It was first imported into Europe in 1998 by Dutch breeder Jan Steverink. Currently stocks are kept in the Netherlands, Germany, Slovakia and the Czech Republic. There are several varieties of the Ayam Cemani including the Swedish Black Chicken. It is thought that Ayam Cemani may also earlier have been brought to Europe by Dutch seamen who had numerous contacts in both Africa and Asia. 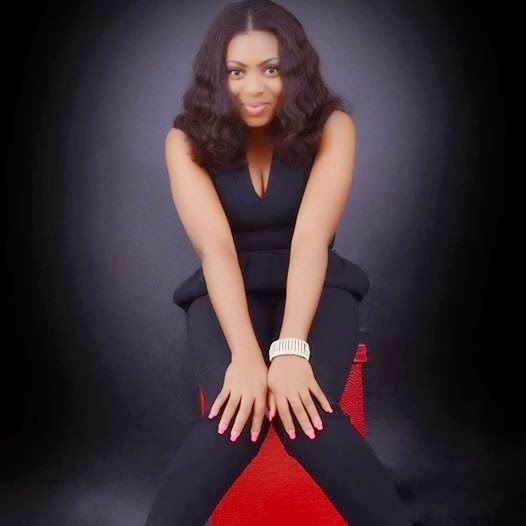 2014 Miss curves UNILAG and CEO of Ella’s place is popularly called phantee. She is a Petrochemical Engineering student at the University of Lagos, Nigeria. She starred in Iyanya’s kukere video. 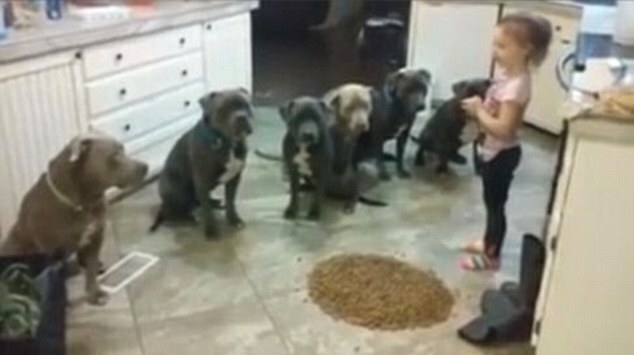 As the six hungry pitbulls surround the four-year-old girl, viewers of this video may be forgiven for believing there can only be one outcome. Each dog is far heavier and more powerful than the small child. Almost 120,000 people however have seen how the youngster fearlessly controls the dogs surrounding her and may be able to take a leaf out of her book. Two hostage sieges came to a bloody and dramatic climax today after police stormed two buildings in France, killing the Charlie Hebdo gunmen and their accomplice. At the first stand-off, Al Qaeda brothers Said and Cherif Kouachi were shot dead by special forces as they tried to fight their way out of a print works. Their hostage, named as Michel Catalano, is believed to have been rescued alive. Moments later, explosions were heard at a second siege in Paris where a fellow jihadi was threatening to kill captives if police stormed the Kouachis. At least one hostage is believed to have survived that stand-off, at a kosher supermarket, in what appears to have been a co-ordinated strike by police. A day after president Goodluck Jonathan described some Nigerian elders as touts, Northern Elders Forum (NEF) yesterday hit back at him, saying most sitting leaders today are worse than pickpockets in motor parks. The group which described itself as a northern political pressure group disclosed this through its spokesperson, Professor Ango Abdullahi at a press conference in Kaduna. The movie ‘Selma’ is making a lot of headlines and so are the cast members. Following the New York premiere of “Selma,” a dramatic account of a pivotal chapter in the civil rights movement, director Ava DuVernay, actor David Oyelowo and other cast members took to the steps of the city’s public library, raising their arms in the “don’t shoot” pose and wearing T-shirts bearing the last words of slain Staten Island resident Eric Garner: “I can’t breathe.” The red-carpet event and protest unfolded on the same December weekend that saw more than 25,000 demonstrators march through the streets of Manhattan after a grand jury decision not to indict a police officer in the choking death of Garner. 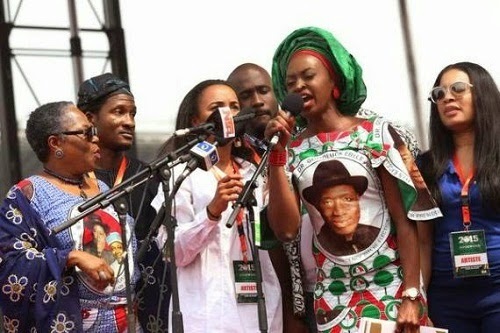 With a tension soaked atmosphere, the Nigeria general election hits a countdown of days as various political parties and contenders continue to rally round for the sympathy and votes of the electorates. Apart from the federating states with rainbow like contending parties, the presidential election which seems to have gained more international interest and attention is arguably between the All Progressive Congress (APC) and the People’s Democratic Party (PDP). Bride Dumps Groom On Wedding Day Because He Is A School Drop-Out. A final student of Federal Polytechnic, Oko in Anambra State, southeast Nigeria, did the unthinkable when she snubbed her groom on her wedding day and called off the wedding already arranged by the two families. The wedding was to take place on Saturday, 3 January, 2015 and guests invited to witness the ceremony at St Patrick Catholic Church, Umuchu in Aguata Local government, Anambra State, were shocked when Ifunanya Igwebuike refused to show up to tie the knot with Ekene Uzoigwe. After several hours of waiting, she later sent a message to the Parish Priest, Rev. Father Lawrence Maduagwu, that she was no longer interested and asked him to cancel the wedding. 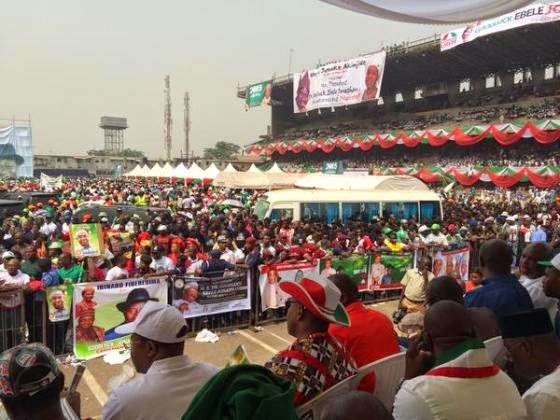 The Peoples Democratic Party presidential campaign kicked off in some style at the Tafawa Balewa Stadium in Lagos, Southwest, Nigeria. The Department of State Service (DSS) says investigations by the service revealed that there was an elaborate plan by the All Progressives Congress (APC) to inflate its membership data ahead of the February 2015 general elections. Addressing a news conference in Abuja, spokesperson for the DSS, Marilyn Ogar, says the party also had plans to hack into INEC’s voter registration database through the creation of party membership forms and cards to match INEC’s voter register across the country. Governor Rochas Okorocha of Imo state, today January 7th donated a presidential campaign bus to APC presidential candidate, Gen. Buhari. Twelve people were killed when armed gunmen carried out a 'massacre' at the offices of a notoriously anti-Islamic magazine in Paris - including a police officer who was executed as he begged for mercy on the pavement. 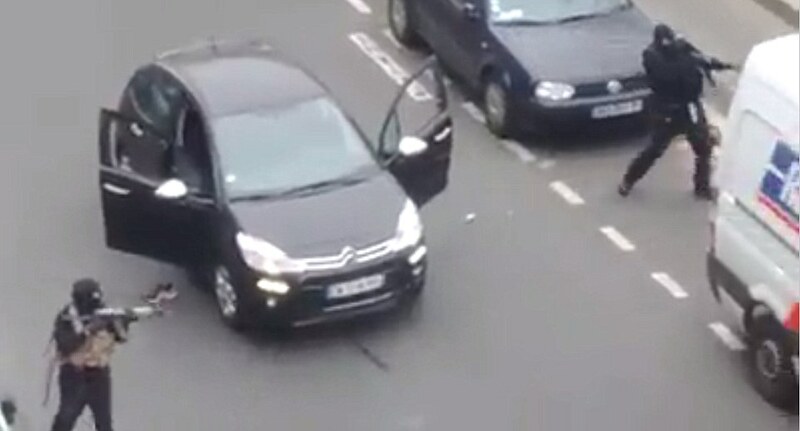 Two masked men brandishing Kalashnikovs burst into the Charlie Hebdo headquarters, opening fire on staff. Police officers were involved in a gunfight with the men, who escaped in a hijacked car, speeding away towards east Paris and remain on the loose. The attackers stalked the building asking for people by name before executing senior staff. Three of France's most revered cartoonists - Stephane Charbonnier, who is also the editor, Georges Wolinski and Jean Cabut - were among those killed. There were unconfirmed reports that a fourth cartoonist called Bernard Verlhac (aka Tignous) had died. An accused thief was beaten to death by a mob in central Mexico after the furious crowd caught him and three accomplices, including a pregnant woman and a teenager, robbing a home. A crowd of some 100 people discovered the four allegedly robbing electronics at a home in the town of Tehuacan, in the state of Puebla. The residents seized the four — two men, a male teenager one woman said to be pregnant and stripped them. Denise Sumpter's 6-year-old daughter Belle is still breast-feeding and Denise says she'll continue do to so until Belle decides it's time to stop. "I'll feed Belle as long as she asks," the 44-year-old mother told Daily Mail. Belle doesn't rely solely on Denise's milk anymore. The little girl nurses anywhere from twice a day to once a week. Sometimes she'll join her 18-month-old brother, Beau in a feeding. Other times she'll latch one when she's looking for some one-on-one time with her mother. "I don't think there's anything weird about it. 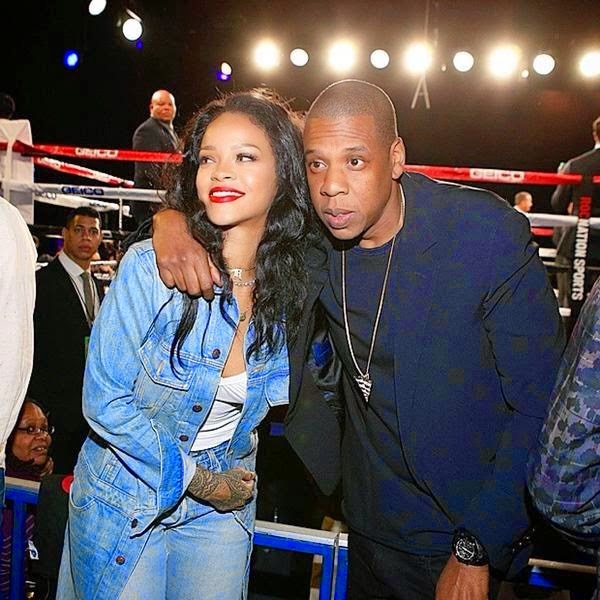 I feed both children on demand, whenever they want it," Denise says. The accused, through his counsel Wale Idowu told the Court he was not involved in dealing with human parts or any other criminal activities. Aliyu said he had been in the business for 12 years so he could make ends meet. Before operating a shrine, he was an auto electrician, then motor parts dealer, but was “duped.” This is when he decided to take up herbs business, and later, into defrauding unsuspecting persons in Lagos. According to him, the shrine for which he was arrested and arraigned came into existence in January this year with the procurement of acre of land from one traditional chief in Ile-Ife inside the thick forest of Mobarajo. The traditional chief in his confession later became one of the influential personalities that assisted him in bringing customers from Lagos, Kaduna and other parts of the country. The national chairman of the Peoples Democratic Party, PDP, Adamu Mu’azu, has warned President Goodluck Jonathan and governors against injustice in the party, saying the ruling party has been degraded by “Use and Dump” politics. Mr. Mu’azu said opposition parties have fed on PDP’s failure to reward its members, who worked for the party, its governors or the president. “Mr. President, I want to appeal to you to consider it a challenge to discuss with your governors, Senators and all elected officials of PDP that members of the PDP should not be used and dumped, adhere to equity, fairness and justice,” Mr. Mu’azu said Tuesday. Story as sent in by one Barrister Chukwudi Iwuchukwu. For Comfort Oluwaseun Adebowale, Marriage is for better for worse. This principle has been her guiding Philosophy since she walked down the aisle with her husband of 15 years Olorode Abimbola Gbenga a teacher in Abeokuta Ogun State. Shocking images show a group of bystanders filming a brave Egyptian police officer as he is killed while trying to defuse a bomb left outside a petrol station on a busy Cairo road. The video, taken on a mobile phone, shows at least three other men recording (left) as the officer, dressed in protective gear, is blasted through the air after the device explodes in his hands. And the callous filmmaker continues even after the debris has settled around the lifeless body of the officer - and passersby have rushed to his side (right). Jihadists have claimed responsibility for the attack, saying they were targeting police officers at a nearby station. 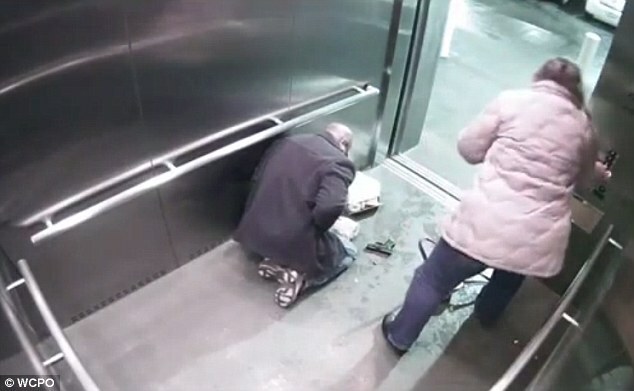 Newly-released surveillance footage shows the dramatic scene inside an elevator the night an off-duty Kentucky cop accidentally shot himself in the stomach after fumbling with his weapon. The video shows Officer Darryl Jouett and his wife entering an elevator at the Mercer Commons parking garage in Cincinnati,Ohio after a dinner date on Friday night. Jouett then reaches into his jacket to remove his semiautomatic handgun, and struggles to readjust the weapon in its holster while balancing the boxes in his other hand. The gun is then seen discharging before falling to the floor, as Jouett clutches his side and slumps to a kneeling position. "I watched the piles of feces go up the conveyor belt and drop into a large bin," Gates, theMicrosoft cofounder and billionaire philanthropist, wrote in a blog post on Monday. "They made their way through the machine, getting boiled and treated. A few minutes later I took a long taste of the end result: a glass of delicious drinking water." The jarring juxtaposition is intentional. 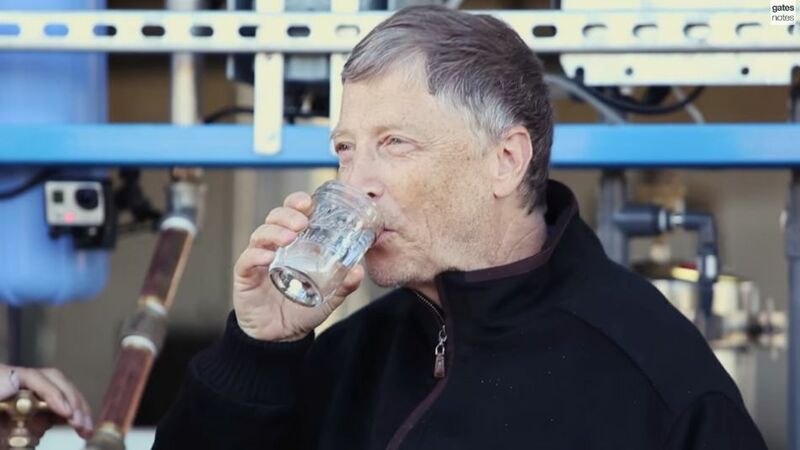 Gates intends to get the word out to the masses about the machine, which is part of a Gates Foundation effort to improve sanitation in poor countries. "The water tasted as good as any I’ve had out of a bottle," Gates continued. "And having studied the engineering behind it, I would happily drink it every day. It’s that safe." The presidential candidate of the All Progressives’ Congress (APC), Gen. Muhammadu Buhari (rtd), on Tuesday gained an unusual support as the main agitating militant group in the Niger Delta, the Movement for the Emancipation of the Niger Delta (MEND), pledged its total support for the former military ruler. This Man Kept HARASSING Women On The Streets. Until One Day… MOM!? November 25th marks the International Day for the Elimination of Violence Against Women. So Everlast created this incredible video, demonstrating how some men disrespect women. A woman might simply be walking along the street before she ends up being harassed. And that’s pretty much what happens in this video. Except there’s a very shocking twist! General Muhammadu Buhari Arrives Port-Harcourt Today For APC Rally. Former President Olusegun Obasanjo has said the country is currently facing economic problems due to the failure of the Goodluck Jonathan administration to plan for a rainy day. He told Iyalodes and eminent women leaders from the South-West, who visited him at his Hilltop residence in Abeokuta, Ogun State, that the nation’s reserves which as of 2007 stood at $67bn had been depleted by the Federal Government. The former President was responding to a call by the delegation led by the Iyalode of Yorubaland, Chief Alaba Lawson, and the Iyaloja General of Nigeria, Chief Folashade Tinubu-Ojo, to lend his voice to the socio-economic crisis rocking the country. Stressing that the country did not deserve the situation it currently finds itself, Obasanjo vowed that he would not keep quiet until the right things were done. He said, “When I was leaving office about eight years ago, I left a very huge reserve after we had paid all our debts. Olive Nebo Ozioma a graduate of University of Nigeria, Nsukka who is in her 20’s was so excited about seeing the first day of 2015 and took to her Facebook page to announce how excited she was, not knowing she will die the following day. "OMG!!! Its 2015..... Is anyone feeling this vibe with me? Am sure you are! Lets celebrate together! We are blessed.... Hip Hip Hip!! !, " she wrote exactly at 3.37am on January 1st, 2015. As the presidential election draws nearer, the camp of President Goodluck Jonathan is leaving no stone unturned to see that they get the support of former president, Olusegun Obasanjo. There are strong indications that the Jonathan over the weekend sent some high powerful emissaries to Abeokuta, the home state of Obasanjo to book for an appointment with him to discuss several issues which will brighten the chances of Jonathan in the presidential election. A Nigerian choral group based in Akwa Ibom State has broken the world record for the largest number of Christmas carol singers in the world. The record, which has been officially certified by the Guinness Book of World Records and pasted on its website: www.guinessworldrecords.com, was broken by the Godswill Akpabio Unity Choir, a 25,272 man-choral group, in a concert in the Uyo Township Stadium on December 13, 2014 with Guinness World Records representatives in attendance. Revelations that worshippers at the headquarters of Christ Embassy Church ‎in Lagos had to pay N1,000 each as gate fee to attend a New Year’s Eve service presided over by Pastor Chris Oyakhilome have shocked many Nigerians and infuriated others. Worshippers who wanted to attend the crossover service at Christ Embassy’s headquarters on Billings ‎Way in Oregun Area of Lagos on 31 December, 2014, were made to obtain gate passes that sold for N1,000 each. Those who could not afford such passes were turned back and told that they could go elsewhere to worship or watch the service online for free. GOV. FASHOLA, BUHARI, PASTOR ADEBOYE & OTHERS AT LAGOS STATE 2015 ANNUAL THANKSGIVING SERV. Lagos State Governor, Mr. Babatunde Fashola SAN (middle), former Head of State and All Progressives Congress Presidential Candidate, General Muhammadu Buhari (2nd left), his running mate, Professor Yemi Osibajo (left), General Overseer, Redeemed Christian Church of God (RCCG), Pastor Enoch Adeboye (2nd right) and his wife, Pastor (Mrs.) Folu Adeboye (right) during the Lagos State Government 2015 Annual Thanksgiving Service at the Lagos House, Alausa, Ikeja on Sunday, January 4, 2015. In early 2014, a man who said he has two functioning penises due to a rare congenital condition known as diphallia "came out" in a Reddit "Ask Me Anything." A year later, he's written an e-memoir. This man, who identifies as bisexual and goes by Diphallic Dude or DoubleDickDude (DDD), is using his memoir, titled Double Header: My Life With Two Penises, to answer more questions, describe his struggles and tell tales of many sexual encounters.